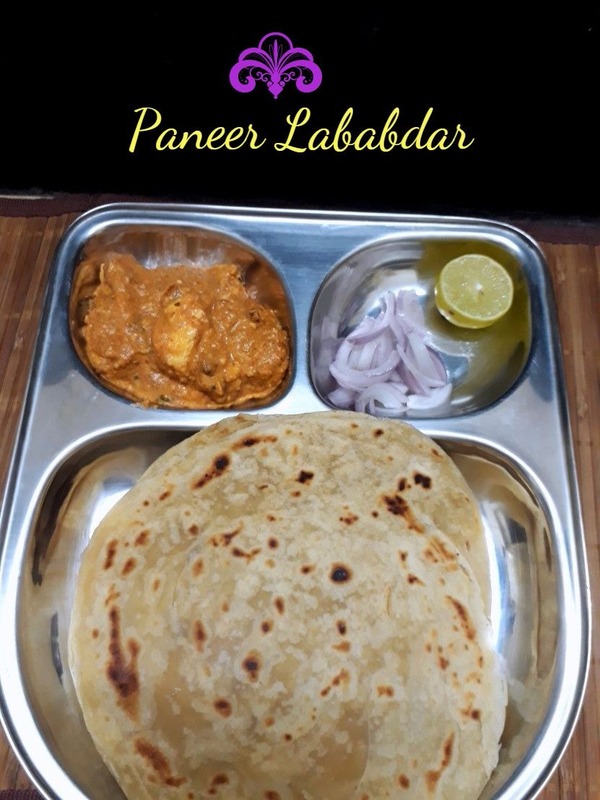 Paneer Lababdar is a rich Restaurant Style Paneer that you can make at home. This gravy is very creamy and rich that pairs well with Naans, Rotis and even for Pulaos. Regular readers will know that my kids are very fond of Paneer and love to have Paneer Butter Masala frequently made at home. While we do make it at least once a week, we almost never change the recipe as they don’t’ want their favorite dish to be modified. I have so many gravies with Paneer, all done because it gets boring for us to cook the same recipe. Almost all the recipes that are there on my sites are my kids favorite. So hoping they are still receptive to a new dish, we wanted to make a dish that Amma had noted down in her diary. She is a regular viewer of a Telugu Cookery program and notes down those recipes that are interesting and can be made at home for kids. 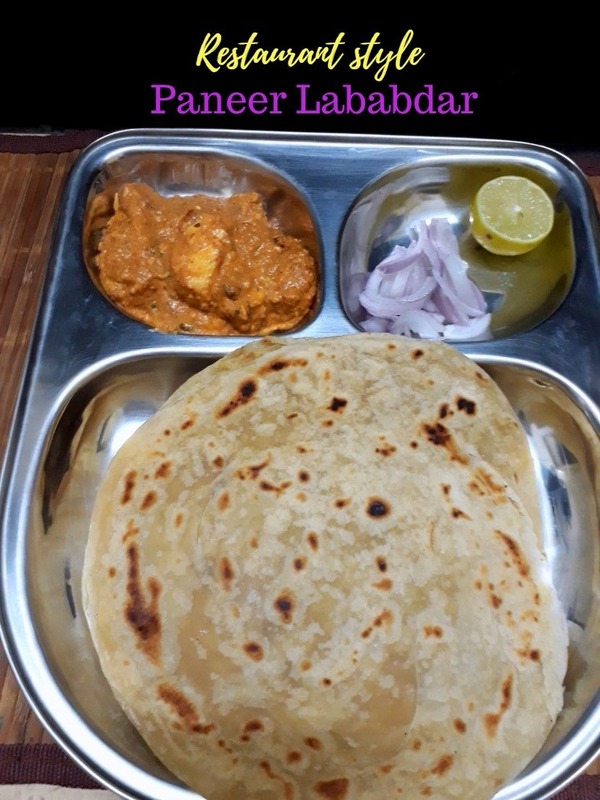 One such recipe was this Paneer Lababdar. While I don’t know the exact meaning of the name, I have seen this listed in the Menu in some restaurants and wanted to make it at home ourselves. So when Amma said she has this recipe noted down, I was keen we should make it. The only hassle was the problem that almost no water is added to the gravy and is very thick and creamy. On top, a teaspoon of honey is added. We were apprehensive that kids may not like the final touch of honey, however, it’s not obvious in the dish when you eat it. And your kids will want this to be made again and again just as mine did. This is one of the recipes that we have repeated many times already, however since we always make it during the weekday and its always a rush, I am unable to click proper pictures of this dish. Unlike before, even planning a proper photoshoot during weekdays have become a hectic task. I sometimes even wonder how I used to do before! Guess with days flying, these things are bound to happen. There is literally no time for anything! With exams fast approaching, we have been busy. So no time to plan for new and different dishes. I was happy I was asked to include an easy theme like this Main Course Rice/Gravy, where I could showcase my everyday gourmet gravy! January zipped through us with so many holidays and we are starting a new Edition this February BM#85. I will be featuring some gourmet gravies along with some Rice one pot meal too. The idea is to emphasize that even on a busy weekday, we can squeeze in a delicious meal for the family! Heat a nonstick pan with oil, saute all the whole garam masala for a couple of minutes. Saute all the above ingredients for about 5 to 7 mins. remove and cool. Make a smooth paste adding just enough water. Heat another nonstick pan, add hing. Then add slit green chilies, saute for few minutes. Next, add the ground masala, saute well in simmer. Then add red chili powder, coriander powder, cumin powder, kasuri methi, combine everything well and simmer for 5 mins. Bring to a boil. Next add cream, salt, grated paneer, paneer cubes. Simmer again till the gravy is nicely thick and cooked. Finally, add the honey and butter, simmer for 5 mins. Heat another nonstick pan, add hing. Then add slit green chillies, saute for few minutes. Then add red chilli powder, coriander powder, cumin powder, kasuri methi, combine everything well and simmer for 5 mins. bring to a boil. The first time we made this gravy, we didn't add any water further after grinding the paste. The gravy is really very thick and creamy. We tried adding some water in the subsquent preparations and felt without water it was really a gourmet gravy. This is part of February Week 1, Cooking from Cookbook Challenge Group. The post Paneer Lababdar | How to make Restaurant style Paneer Lababdar appeared first on Cooking 4 all Seasons.